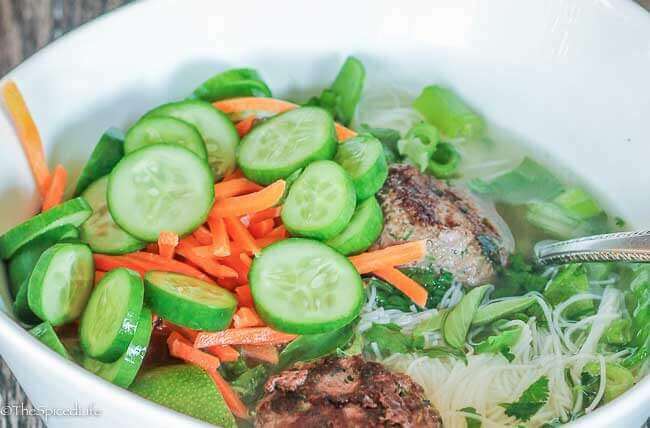 Easy Vietnamese Meatball Noodle Soup is the answer to your weeknight dinner dilemma! 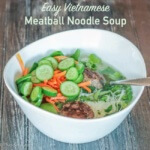 Super easy, fast and fresh, this soup satisfies your Vietnamese food cravings. Affiliate links have been used to link to items I am discussing. Ack! I know I have been a little slow between my last two posts. Sorry about that! Cooking is indeed happening again at Casa The Spiced Life but blogging still needs to be worked in between unpacking. What? you ask, you still have more boxes? People I am afraid I may have boxes until 2018. Slow and steady wins the race, right? 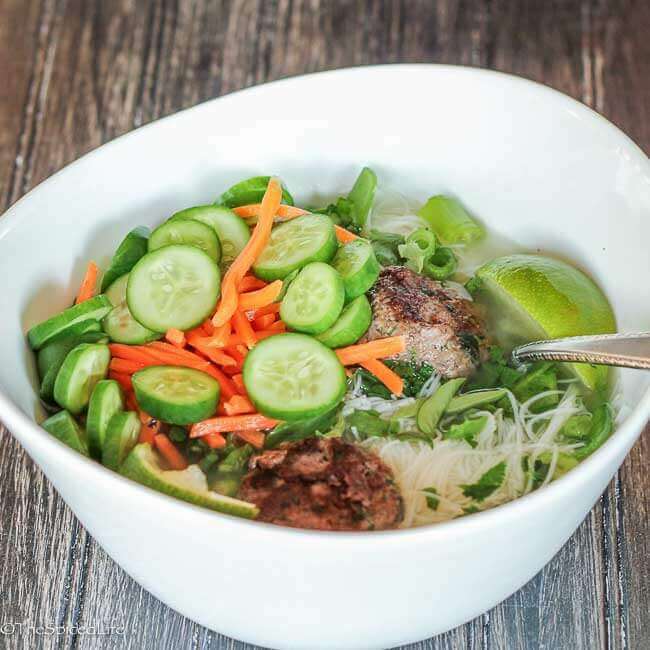 So about this Easy Vietnamese Meatball Noodle Soup, which was a big hit with my family. 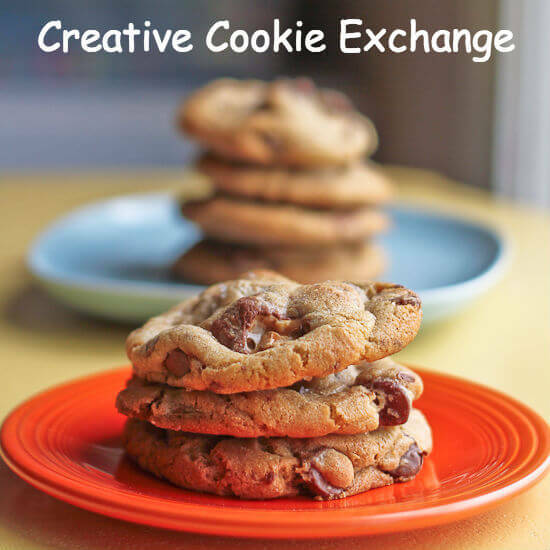 It is another one adapted from a recipe in John Gregory-Smith’s Mighty Spice Express Cookbook: Fast, Fresh, and Full-on Flavors from Street Foods to the Spectacular , which is rapidly becoming one of those treasured used bookstore finds. I have now made 3 dishes inspired by recipes in it (some closer to the original than others). That is a lot in a short span of time–and I have more still I want to make! If you like internationally inspired easy meals, I seriously suggest you check this book out! 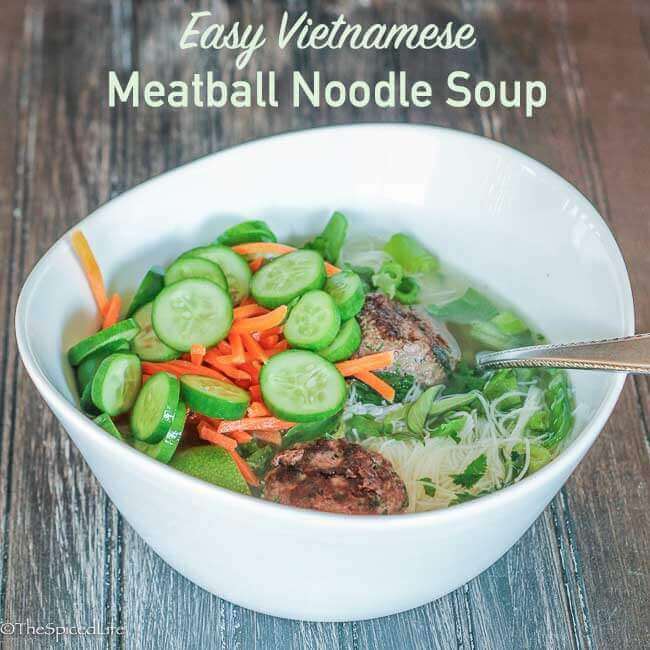 Easy Vietnamese Meatball Noodle Soup is, to my mind, what would happen if bun and pho had a baby. It is a brothy soup, which automatically puts you in mind of pho (for Vietnamese soups anyway), but it is crunchy, fresh and inspired more by the flavors of bun. Like all weeknight cheats, it does not quite have the depth of either pho or bun, but it is much faster and easier–and was devoured all the same. (Truthfully bun is almost as easy but pantry chicken stock is easy to come by when you haven’t been to the grocery store in a while and have no fresh lettuce.) The meatballs were the real star and inspired one of those occasions where we all had to count how many we took to make sure everyone got the same amount. As mentioned, this soup is extra easy if you keep commercial low sodium chicken stock in your pantry, but I confess I did think wistfully how much better it would be with homemade stock. A thinly sliced red chile pepper could be added for those who enjoy heat, and if I could find bean sprouts I would add those next time. Heat the oil in a medium sized pot over medium heat. Add the peppercorns, star anise and cinnamon stick. When the cinnamon stick starts to unfurl and the spices are fragrant, add the chopped white parts of the scallions. Cook the scallions for about 5 minutes. Add the chicken stock and lemongrass and bring to a boil. Cover and reduce the heat to maintain a gentle simmer while preparing the rest of the dish. In a large bowl, gently mix all of the meatball ingredients. When they are evenly incorporated, divide the meat and then divide each half yet again. 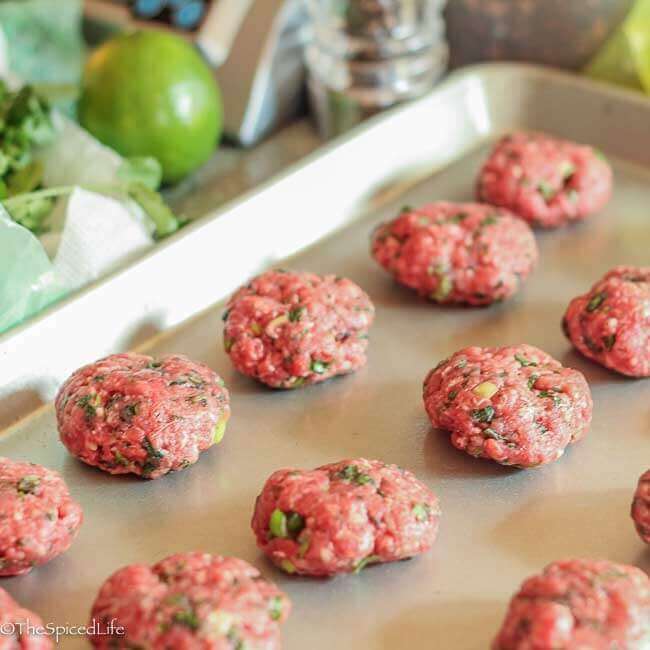 Make 4 evenly sized meatballs out of each quarter to end up with 16 meatballs of roughly the same size. Heat a large, heavy skillet over medium heat. I used enameled cast iron and was confident the ground beef had enough fat to not need any oil, but if you are using stainless steel or a leaner ground beef you may want to brush the skillet with a little vegetable oil. Cook the meatballs in batches--you want the heat high enough to brown the meatballs but low enough that they will not burn while the centers are cooking. While the meatballs are cooking, prepare the noodles and make sure all of the remaining garnishes are prepped. Add the fish sauce, lime juice and sugar to the cooking broth. Taste for more of any of those. When the meatballs are all cooked, assemble the soup: place some noodles in the bottom of a bowl. Add a sprinkle of each kind of herb. Ladle as much broth as desired over the noodles, and last add the meatballs and the carrots and cucumbers (you want to add the carrots and cucumbers last so they stay crunchy). Serve with lime wedges and extra fish sauce on the side.